In a bizarre incident, a newborn male baby was found abandoned near a culvert at Daolabari Tea Estate in Kokrajhar district on Monday morning. According to locals, one Gabardan Singh, who lives in the area, first noticed the baby at around 4.45 am near a culvert along the tea garden road and informed it to his elder brother Mangal who informed it to the village headman. The village headman later informed the Kokajhar Police. 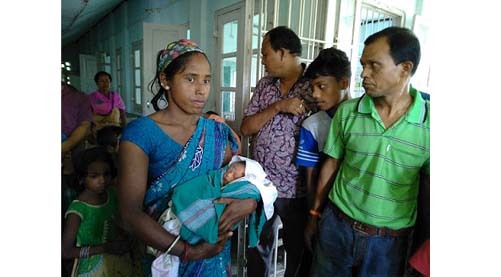 After being rescued, the infant was first taken by the police to Daolabari Tea Estate Hospital and later taken to Kokrajhar Rupnath Brahma Civil Hospital and was kept in the baby care unit of the hospital. The baby is stated to be in good health. The baby was found wrapped in a towel with a clip marking identity of the baby. Some locals said they saw a Bolero vehicle at that time and suspect that someone might have dumped the newborn in the area. The baby is now under the care of Childline and will be sent to Special Adoption Agency, Nichima in Chirang. Mangal Singh and his wife have expressed willingness to adopt the baby. “Today is Krishna Janmashtami, the birthday of Lord Krishna. The baby must be a special one. I would like to adopt the baby,” said Mangal, who has a son of his own. He also said that during check-up of the baby they found a clip marking the identity of the infant and suspected that the newborn was delivered in some hospital because clip sign was attached to the body. A police official said that they have been investigating into the incident.